Sudha had the exalted privilege of being one of the eleven members in the organizing committee for the grand centenary celebrations, which was conducted by Shri. Ramabhadran, founder of SAFE (Shanti Arts Foundation & Endowment). On 6th January, 2010, the day of the inaugural, it was Sudha again who commenced the function with an invocation. Shri Karan Singh, President of the Indian Council for Cultural Relations, one of the Chief Guests for the occasion said, “By honouring the memory of such legends, we do not merely fulfill our responsibility, but inspire the younger generation to aspire to reach standards set by such great people”. Emphasizing that music played an integral part in the nation’s culture, Mr. Singh said every state has been contributing to it through arts, but Tamil Nadu made a particularly important contribution. Music is one of the greatest gifts of human evolution. Despite violence and ‘all kinds of negativities’ ailing mankind, the tradition of music survived because of the flourishing guru-sishya parampara. In an offline chat with Shri Karan Singh, before the commencement of the function, Sudha spoke to him about an occasion when both, her Guru MLV Amma and she had sung before him, which he recalled instantly. During the conversation, he mentioned to her that the raga Mohanam was one of his favorite raagas. 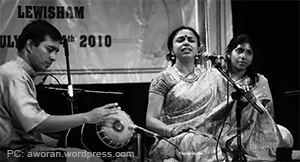 On the spur, Sudha included the raga Mohanam in her rendition of ‘Manikya Veena’ for the invocation….a small tribute to the music lover. She also sang ‘Nee samana mevaru leranu’, the unique GNB composition.